"Mind Your Mummy Mommy, Mario"
"Mind Your Mummy Mommy, Mario" is the third episode of The Adventures of Super Mario Bros. 3. It aired on September 15, 1990 alongside another episode of The Adventures of Super Mario Bros. 3 entitled "The Beauty of Kootie". Hip and Hop Koopa are exploring a pyramid in Desert Land, where they find what they claim to be looking for upon entering the pyramid's tomb, despite the fact that Bowser expected them to mess up. Startled from almost tripping on a shattered Dry Bones, Hip and Hop stumble into each other and crash into a vase, breaking it. Relieved that nothing bad happened, Hip and Hop are startled when a nearby sarcophagus starts to make thumping noises on its own. Not wanting to find out why the sarcophagus is acting up, Hip suggests that they grab the other sarcophagus, belonging to Prince Mushroomkhamen. Lifting the case up together, Hip and Hop exit the tomb with it. Shortly after they leave, a mumified queen named Queen Mushroomkhamen comes out of the thumping case, screaming that the Koopalings have stolen her son. Queen Mushroomkhamen comes running out of the pyramid, and chases after Hip and Hop through Desert Land. Frightened by the sight of Queen Mushroomkhamen, Hip and Hop carry the case up several platforms and into a Warp Pipe, where they manage to hide from Queen Mushroomkhamen. Taking a good look at the face on the case, Hop realizes that Prince Mushroomkhamen bears a huge resemblance to Mario. Mario about to wake up from his nap. By hearing this, Prince Mushroomkhamen is revealed to be Mario, who wakes up from taking a nap at Toad's holiday house in Desert Land, when Princess Toadstool comments about how a nap must've been relaxing after his latest adventure. Mario then mentions that he's still tired, but he's quickly distracted by a Mushroom boy who comes running into the house, screaming about a mad mummy on the loose in Desert Land. Mario leaps out of bed and tells his friends that they need to stop the mummy immediately. Queen Mushroomkhamen, still in search of her son, chases several Mushroomers through a bazaar in Desert Land, but she loses them when a tent collapses on her. Mario, Luigi, Princess Toadstool and Toad arrive on the scene, but Queen Mushroomkhamen tosses several ♩ Blocks in their direction and stomps on a tent in her rage. Mario proposes that he'll calm Queen Mushroomkhamen down, but first Queen Mushroomkhamen tosses a tent on top of him. Princess Toadstool pointing at the Koopa twins. Hip and Hop, who are still hiding out in the pipe, choose to make a run for it with Queen Mushroomkhamen now distracted. When Mario gets out from underneath the tent by jumping through it, Princess Toadstool wonders why Queen Mushroomkhamen is upset. Her question is quickly answered when she sees Hip and Hop run past them with Prince Mushroomkhamen's sarcophagus, so she gets Luigi and Toad to chase after the twins with her and tells Mario to keep the mummy under control while they're gone. Mario approaches Queen Mushroomkhamen, and tries to calm her down by asking to speak to her. When Queen Mushroomkhamen takes a good look at Mario, she mistakes him for her son, and announces that she's thrilled to have finally found her "little prince". Puzzled with the fact that Queen Mushroomkhamen thinks that he's her son and the fact that she now wants to hug him, Mario tries to jump away from her, only for the mummy to catch him in her arms. While Mario screams for help, Luigi, Princess Toadstool and Toad chase after Hip and Hop. The twins run over a sand dune with the case, and board the Doomship, which was apparently waiting for them on the other side. 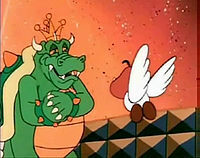 King Koopa then congratulates Hip and Hop while taunting Luigi, Princess Toadstool and Toad, as the Doomship flies off. To make matters worse, Queen Mushroomkhamen carries Mario in her arms back to her pyramid, where she tells him that she'll never let him get lost again. 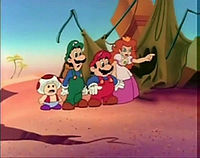 Luigi worries that Mario is now going to be lost in a tomb forever, and Princess Toadstool remarks that they'd need a map of the pyramids to find him. 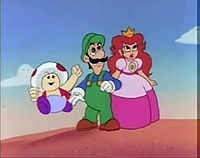 Toad remembers that he has a cousin who might be able to help them, so he takes Luigi and Princess to visit him. It doesn't take much convincing for Toad's cousin to then sell a map to the mummy tombs to Princess Toadstool. Luigi proclaiming the map false. 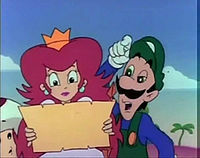 Upon looking at the map, Luigi sees Prince Mushroomkhamen's picture on it, and proclaims it to be a phony because he mistakes him to be Mario. Princess Toadstool, however, deduces that it's actually Prince Mushroomkhamen, and realizes that the prince and Mario look similar. Toad then points out that Queen Mushroomkhamen kidnapped Mario because she mistook him for her son. Princess Toadstool explains that they'll have to break into Castle Koopa, retrieve Prince Mushroomkhamen's case, so that they can bring it back to Queen Mushroomkhamen in exchange for Mario. In the tomb, Mario rejects Queen Mushroomkhamen's request to give her a kiss. Thinking that Mario needs a rest, Queen Mushroomkhamen tells him that he needs to take a ten-thousand-year nap, and wraps him in canvas. Barely able to move, Mario tries to hop out of the tomb, but Queen Mushroomkhamen grabs some of his trailing canvas, and places him in her case. Luigi stuck on the castle with the Steam Cloud Balloon. Meanwhile, Raccoon Luigi is flying through Dark Land towards Castle Koopa, towing his own Steam Cloud Balloon that Princess Toadstool and Toad are riding in. Just as Princess Toadstool points out that their plan to sneak into the castle is foolproof, Luigi and the balloon get caught in a Mushroom Kingdom Twister, and get thrown towards a tower of the castle. 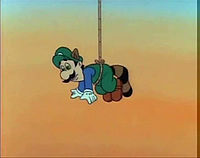 Although nobody got hurt, Luigi is upset due to the fact that the twister destroyed his Steam Cloud Balloon. Additionally, two Paragoombas spot them, and prepare to alert King Koopa. Princess Toadstool directs Luigi and Toad into the tower, where they find Prince Mushroomkhamen's case. Their only concern now is getting the case past Koopa. Luigi then asks himself "What would Mario do if he were here? ", and gets an idea; he salvages parts from the Steam Cloud Balloon and builds a Steam-Powered Mummy Sled with them. King Koopa pleased to hear the invaders trapped. King Koopa, Hip, Hop, and several Paragoombas gather at the base of the stairs leading to the tower, where one of the Paragoombas tell Koopa that they've got the invaders trapped. Telling Hip and Hop to watch him as he prepares to take care of the heroes, Koopa orders Princess Toadstool to get down from the tower, and just as he does, Luigi, Princess Toadstool and Toad come speeding out of the door on the Mummy Sled with Prince Mushroomkhamen's case. The Koopas run down the stairs to avoid getting hit, while several Paragoombas go after the riders on the sled, but they miss due to the fact that the riders ducked. The Paragoombas fly after them again, but Luigi knocks them away with his raccoon tail. Several more Paragoombas foolishy stand in the way of the sled, and get knocked aside like bowling pins. After going down another flight of stairs, and bypassing several Chain Chomps, the sled goes flying out of the castle, lands in the moat, and takes off like a motorboat. Mario saying that he'll get hungry if he sleeps for ten thousand years. Back in the tomb, Mario notices that Queen Mushroomkhamen has fallen asleep, and decides to make a break for it. Mario makes a huge leap into the air, smashes through the roof of the pyramid, waking up Queen Mushroomkhamen in the process. Mario hops down the side of the pyramid, just in time to meet up with Luigi, Princess Toadstool and Toad, who've returned with the sarcophagus. Luigi hugs Mario, but Mario tells him to stop, as he's already been hugged plenty, while Princess Toadstool unwraps the canvas over his body. When Princess Toadstool asks about Queen Mushroomkhamen, Mario remarks that he left her behind in the tomb, just as the mummy smashes through the wall of the pyramid. Queen Mushroomkhamen asks what's going on, so Princess Toadstool explains that there was mixup, and directs the mummy's attention to Prince Mushroomkhamen's case. Queen Mushroomkhamen then scolds Mario for being an imposter. Upon taking a look at Luigi, Queen Mushroomkhamen points out that he looks exactly like her husband, and tries to get him to come with her. Luigi asks to be excused, announcing that he needs to find Toad's cousin, so that he can buy a map to "someplace else". As Luigi runs off into the sunset, his friends, as well as Queen Mushroomkhamen, all chase after him. When the mummy case is seen by Hop and Hip, saying this looks familiar, the object is in Toad's holiday house. 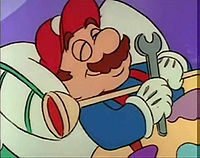 The frame afterward shows Mario with brown eyebrows and moustache instead of black. 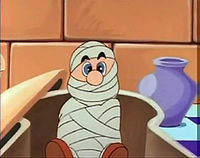 In a scene when Hip and Hop are escaping with the mummy case, it is colored to look like Mario. When the map salesman is talking about his different types of maps, Luigi's eyes are not colored in. When Hip and Hop are running with the mummy prince's casing past Luigi, the Princess and Toad, their heads are orange. When Hip and Hop first enter the tomb, the former's hair is missing. When Raccoon Luigi is inside the Twister, his tail is completely black. When Raccoon Luigi defeat some Goombas in his sled, his raccoon ears are missing. When Raccoon Luigi is chasing Koopa and his sons, the king's skin is light green and his shell is completely dark green. When Queen Mushroomkhamen is running to Mario thinking he is her son, part of her bandages are green. This is one of two episodes where Hop has pink hair in a shot (the other is Life's Ruff). This is one of two episodes that weren't included in any SMB3 single-dvd (King Koopa Katastrophe / The Trouble With Koopas / Koopas Rock / What a Wonderful Warp). The other is Princess Toadstool for President. Nintendo Power's Strategy Guide for Super Mario Bros. 3 refers to Desert Land's pyramid level as "the lost pyramid of Mushroomkhamen". ↑ May 20, 2015. "Mind Your Mummy Mommy, Mario", dubbed in Romanian by KidsCo. Odnoklassniki (OK.ru). Retrieved January 4, 2016. "Sneaky Lying Cheating Giant Ninja Koopas" • "Reptiles in the Rose Garden" • "Mind Your Mummy Mommy, Mario" • "The Beauty of Kootie" • "Princess Toadstool for President" • "Never Koop a Koopa" • "Reign Storm" • "Toddler Terrors of Time Travel" • "Dadzilla" • "Tag Team Trouble" • "Oh, Brother!" • "Misadventure of Mighty Plumber" • "A Toadally Magical Adventure" • "Misadventures in Babysitting" • "Do the Koopa" • "Kootie Pie Rocks" • "Mush-Rumors" • "The Ugly Mermaid" • "Crimes R Us" • "Life's Ruff" • "Up, Up, and a Koopa" • "7 Continents for 7 Koopas" • "True Colors" • "Recycled Koopa" • "The Venice Menace" • "Super Koopa"
Africa • Antarctica • Australia • Brooklyn • Florida • Hawaii • Hollywood • Kansas • Miami • New York City • North America • Paris • South America • United States of America • Venice • Washington, D.C. This page was last edited on March 17, 2019, at 15:58.